Electric utilities provide vital continuous and critical electricity supply to billions of people across the globe. But some areas face extreme weather: floods, high winds, storms, fires, hurricanes or heat waves. These conditions create exceptional challenges for power supply continuity and can result in widespread damage to the power infrastructure and cause severe outages, affecting significant numbers of electric utilities’ customers. The best way to deal with extreme weather conditions is the creation of a robust power network that improves monitoring and control and automatically responds to any major crisis — enhancing confidence in supply continuity during extreme events. Power outages: When a power outage occurs, finding the source can be a challenge at any time. In large parts of regional and rural Australia, the reality of isolating the problem along hundreds of kilometers of line is formidable due to lack of full SCADA coverage and the distances to travel to locate the fault. Safety issues: In some regions hit by heat waves during summer, there is a high risk of bushfires because of the hot and dry climate. Faults on overhead lines may cause bushfires, power poles can fall due to high winds or fire and so must be identified, disconnected and isolated as quickly as possible. Taking on this kind of challenges and solving these issues, requires a highly capable grid management system that provides real time monitoring, pinpoint accuracy, and a high degree of automation and control. The installation of an advanced distribution management system, together with grid automation equipment and pole-mounted switchgear, provides one of the best solutions for electric utilities. It gives them better visibility of their network, allowing them to capture their network structure for one centralized source of truth. The modern advanced network management system reduces the duration of power outages and the number of households the outage affects. It does this in a split second, by identifying where a line outage has occurred and rerouting the electricity grid to bypass this section. Then, the location of the outage is precisely pinpointed so maintenance crews can be dispatched efficiently. Additionally, most current networks have many schematics and feeder plans that are recorded on paper. With the implementation of a new system, these are recorded electronically and consolidated. Not only does this reduce safety concerns but it improves SAIDI1 & SAIFI2 figures resulting in a more cost effective utility network. What’s important to remember? Ensuring electrical supply in harsh environments is never going to be easy. The power of nature can sometimes defeat even the most robust electrical engineering. But a good partner can always help handle these conditions and actively provide solutions when outages are experienced. Due to climate change, extreme weather events are becoming more frequent — and it often means power blackouts. 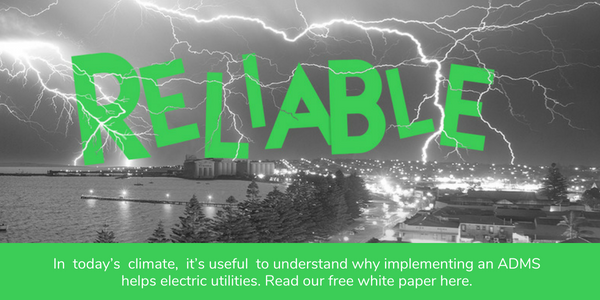 In today’s climate, it’s useful to know more about the evolution of utility outage management and understand why implementing an advanced distribution management system helps electric utilities: Read our free white paper “Enhancing Utility Outage Management System (OMS) Performance”. 2System Average Interruption Duration Index (SAIDI) which measures the number of interrupted minutes a customer experiences in a year. Great post! Thanks for sharing the post. It will surely help beginners update their knowledge. The efforts you have put in to create the posts are quite interesting. Keep up the good work!